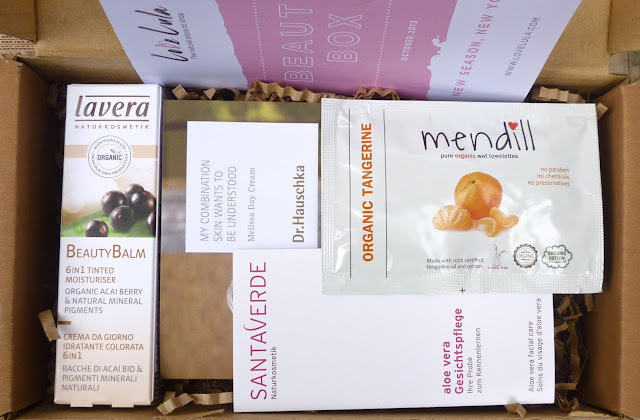 I was slightly frustrated this morning when I missed the postman by one minute so I had to wait 'til later on in the day to pick up this month's LoveLula Beauty Box. I'm really not sure what to think of this month's box. The first thing I spotted was Lavera's BB cream which I wanted to buy anyway (as I mentioned in my last Sample Stash post) so I was initially excited, but after seeing how sparse the rest of the box is I was kind of disappointed to be honest to just have more samples to add to my ever-growing collection. The actual monetary value is really good this month - around £21.50 (box costs £12.50 including P&P) - but I just can't help but be less than impressed considering there's only one main item. 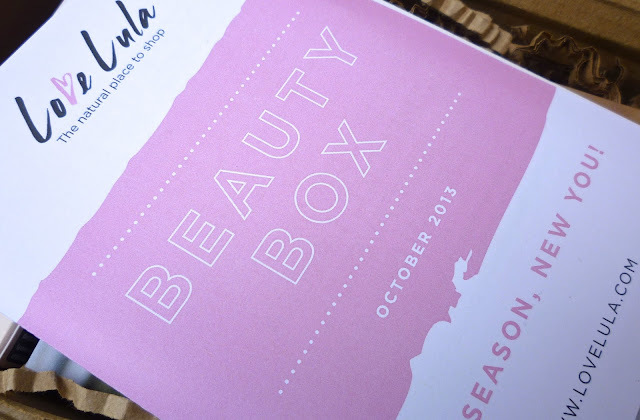 I was pretty underwhelmed with last month's newly rebranded LoveLula box too so I'm seriously considering cancelling my subscription and getting Souk Souk's box instead, but I don't know!! What do you think of this month's box? Would love your opinions on what you think I should do?! I've tried a sample of the Lavera BB and all I could feel and smell was the alcohol, it was horrible! Well you kind of know my thoughts already since I commented on Love lula's boxes before and I did stop my membership with them after a couple of months..The box and the products are actually nice but just not enough for me to justify a monthly membership. Now I would definitely go for the Souk souk boxes instead. By sound of it they have gone back to how they started - 1 full size product and them few samples. Loads of people did not like it this way and then they came up with different concept - miniatures and samples. Maybe wait another month then decide. Unless you wanna quit and try the other box lol. I'm a subscriber too and thought the value of this box was appalling compared to any other beauty box out there. I'm going to see how the next one is but if it's rubbish too I will unsubscribe. I would be disappointed with just one main product! The SoukSouk boxes are really great! I think there has only been one month where I wasn't overly happy with it but it was still a good box! I saw this month's box online before I received my own box. I'd unsubscribed before it has even arrived at my house. The monetary value might be more but that isn't why I subscribed to a beauty box. Even if I had only received one main product with one other generous sample, I would have been happy than a box of samples. The sachets aren't even big enough to get a good idea of the product inside.